Small and marginalized farmers in the Sirsi region in India face many challenges accessing the technology and capital they need to improve their livelihoods. This article highlights how S3IDF partnered with a grassroots NGO to address these issues by helping them form a Farmer Producer Company and establish a permanent credit solution with a local bank. The Uttar Kannada district in the Indian state of Karnataka is divided into 3 topographical zones; the coastal zone, hilly zone, and the plains. This case study focuses on the agriculture ecosystem in the hilly zone towards Western Ghats, India. The region receives high rainfall, making it suitable for cultivating a diverse range of crops, however, the majority of farmers (around 85%) have landholdings of less than 2 hectares due to the geographical nature of the region, presence of protected forests and high rate of land fragmentation. The primary crop grown in the area is the areca nut, a commodity with a history dating back 2,000 years in India. The low-impact agriculture system around cultivating the nut is considered very promising for conservation efforts, and plantations have been shown to support a wide array of bird species in particular. The areca tree is similar in shape to a coconut tree, but it has a weaker trunk. Areca nuts are harvested between October and February in Karnataka at two stages of ripening hasi (green, unripe) and chali (orange, ripe). There are multiple production services involved in preparing the crop which are highly labor intensive, the most challenging (and risky) of which is harvesting. It is a specialized task typically performed by men, which involves climbing the areca trees and hopping from one tree to another to cut down the nuts from each tree. The younger crop, hasi, is traditionally processed by manually peeling (done by women), boiling (usually done by men) and drying the nut within 7 days of harvest. However, due to an increase of unseasonal monsoons, drying the nuts within the requisite timeframe has become more challenging without mechanical dryers. Further, shrinking profit margins among farmers due to loss of crops after harvesting have compromised the farmer-labor relationship, straining the agriculture community and leading to a shortage of labor. Currently, hasi yields higher value than chali due to a greater demand in the global market. 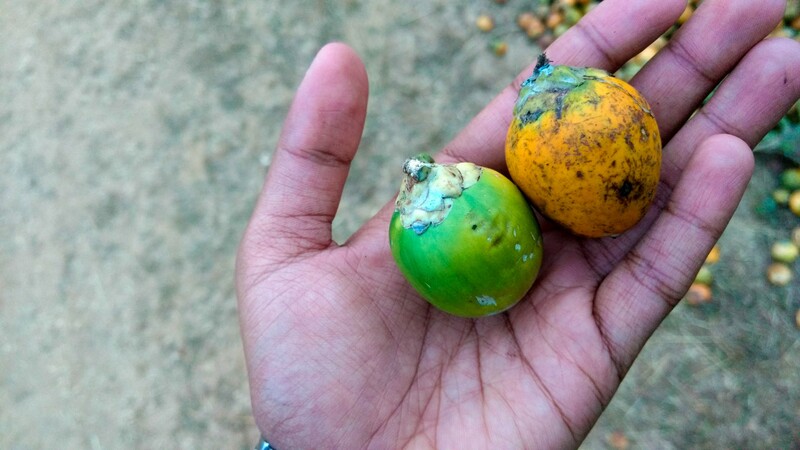 Chali nuts are harvested when the areca nut ripens into an orange color and can be processed throughout the year. The de-husking of chali is traditionally done manually, but with use of specialized machinery, they can be processed significantly faster. 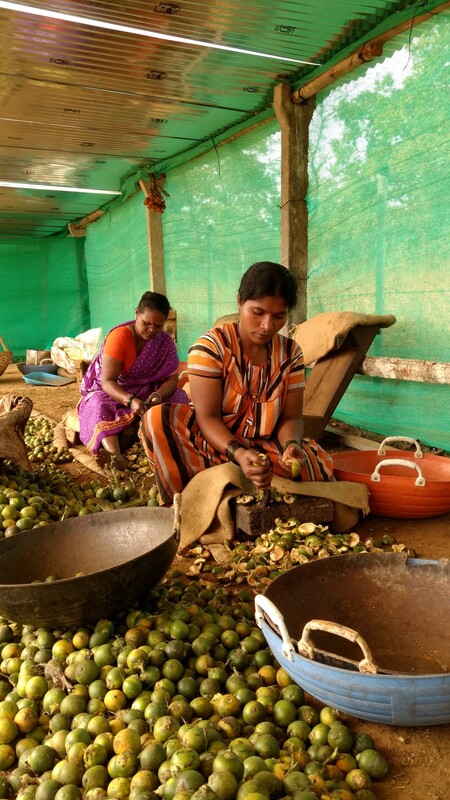 Additionally, given access to the appropriate technology, several by-products may be obtained from processing the acrea nut, and further strengthen the farmers and laborers livelihoods. A natural dye can be extracted during the hasi boiling process, and biodegradable plates can be made by pressing the dried areca leaves. However, small and marginal farmers in the region lack the financial and technical access that could facilitate more efficient and additional processing, forcing them to miss out on critical value add that would ultimately strengthen their livelihoods. Subsequently, these under-served farmers are often overwhelmed by indebtedness, successive crop failures and low yields, one repercussion of which is high rates of farmer suicides. Manuvikasa is a local grassroots NGO, which recognized farmer collectivization as a solution to help farmers capture a higher value for the areca nut and formed the Pragatimitra North Kanara Farmers Producer Company (Pragatimitra), a Farmer Producer Company (FPC) with farmers making up the only shareholders. The primary objective of the FPC is to overcome critical barriers to access using collectivization principals and integrated support, and help small and marginal farmers and laborers strengthen their livelihoods. Despite initial success in increasing employment stability for laborers, the lack of mechanized technology, to perform post-harvest processing, and the financing to purchase said technology, was a critical element inhibiting Manuvikasa’s ability to strengthen the FPC. Although the supply of such technologies exists in the formal market, a machine that could collectively mitigate the constraints of productivity, scale, mobility, usability, and quality was missing. S3IDF began a partnership with Manuvikasa to collaboratively engage with the technology and financing challenges. S3IDF initially provided a 5 lakh INR partial guarantee to leverage a loan of 10 lakh INR (~15,400 USD) from Pragatimitra Souharda Sahakari Niyamita, a local labor agricultural cooperative. S3IDF and Manuvikasa then assisted the FPC in using the loan to commission a local fabricator to make a chali de-husking machine, which addressed the problem of labor shortages and limited access to technology. Further, the machine is portable, so it can be brought from farm to farm, and it can de-husk 35 kilograms of chali in 15 just minutes, saving farmers Rs 1100 per 100 kilograms. Beyond the financing of the new machine, the loan also helped the FPC build its credit history, and enabled additional structural investments. To further strengthen the FPC, S3IDF coordinated with our partner, Vijaya Bank, to secure additional financing using Pragatimitra’s newly demonstrable credit history. Vijaya Bank agreed to extend a collateral free credit line of 10 lakh INR (~15,400 USD) to the FPC. This credit line is the first such financial product that Vijaya Bank has offered to a Farmer Producer Company, and its significance is complemented by its opportunity for future programmatic expansion. This financing, with S3IDF and Manuvikasa’s guidance, was used to purchase a biomass boiler, secure a water connection, and create a safer and more comfortable space in which the laborers work. Due to the significant infrastructural improvements, financing and purchases made by the FPC, over the course of our engagement membership has increased by over 30%, 97 small and marginal farmers’ income increased 22%, and 83 additional landless laborers are employed. Today, the investments have yielded positive returns and S3IDF continues to expand the services and reach of the FPC in Siddapura and Yellapura. Our ultimate goal for this project is to establish a more permanent credit solution for Pragatimitra that would make S3IDF’s involvement redundant. Vijaya Bank (in collaboration with S3IDF) is exploring guarantee funding from the Small Farmers’ Agro-Business Consortium (SFAC) that would enable the Bank to extend up to a 1 crore INR credit line (~$154,000) to the FPC. S3IDF and Manuvikasa have been able to achieve these objectives through mobilizing labor and machinery and providing collective harvesting and processing services to its farmer members, as well as to ensure steady employment to laborers throughout the year, the majority of whom are landless workers. Manuvikasa, a local grassroots NGO, have partnered to collectively address the myriad of challenges faced by these small and marginal farmers.